4 weeks ago, Wishpond's marketing team met to discuss how we planned to meet our growth goals for the next quarter. One of the main things we talked about was webinars. I've always enjoyed the sound of my own voice, so I thought I'd give it a go. This article covers the last month of my life, giving you an inside look at what it takes to put together a successful and profitable webinar which people love. A meeting in the Wishpond boardroom: I'm currently working remotely from the UK, so imagine my big, bald head 5-feet tall and projected onto the wall. We're brainstorming topics, trying to choose a webinar topic which ticks all the boxes. 1. What will our target market be interested in learning more about? A webinar on Justin Bieber may get people to register, but those people wouldn't be particularly interested in buying your email software after the fact. 2. What subject is related enough to your business that an offer related to it would be desirable? Your target market may care about sales optimization, but if your business sells Wordpress themes, your post-webinar offer won't get a lot of interest. 3. What do I know about? What am I a genuine expert in? This one goes without saying. You are the primary reason people register. You need to have a demonstrable expertise in your webinar's subject matter to get them in the door. 4. Can this topic be visually-represented? Does it have visual elements? You talking without a slidedeck or screen capture gets boring fast. Choose a topic which engages your attendees visually. 5. Will this topic stand out from the crowd in some way? You're not the only business or marketer running webinars. Tie your topic into a current event, or put a spin on it (original research, perhaps) which helps you stand out from competitors. 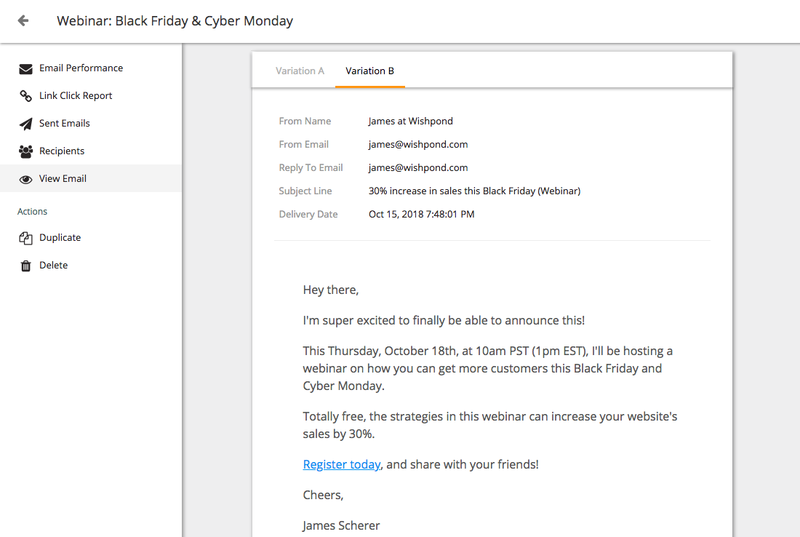 After throwing a bunch of ideas up on the board, we landed on one which we felt ticked all these boxes: Black Friday sales strategies: timely, interesting to our target market, and delivering strategies which attendees wouldn't have seen before. And, as important as any of those, this topic gives Wishpond the opportunity to show off the value of our software to prospective customers. For project management, we use Asana. It allows us to see exactly who's responsible for each task, when that task is due, and (most importantly) to leave little notes for each other - some of which are even relevant to the task! This calendar dictated our responsibilities for the next few weeks. At this point the Wishpond marketing team separated to divide and conquer. 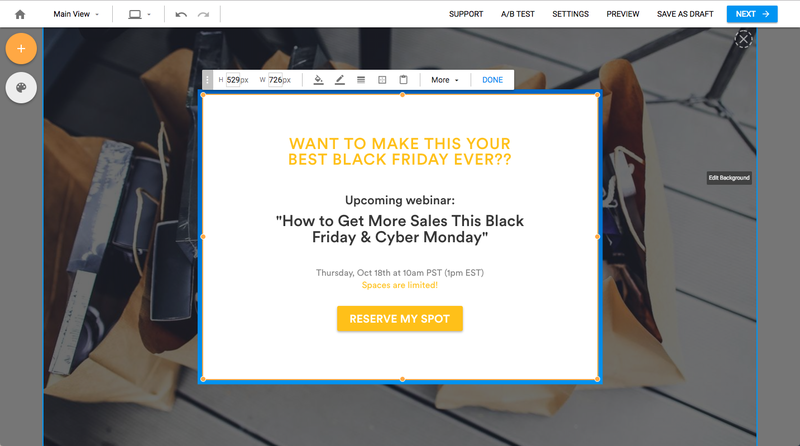 Dividing and conquering is the only way to create a complete webinar campaign. There's so much to do. 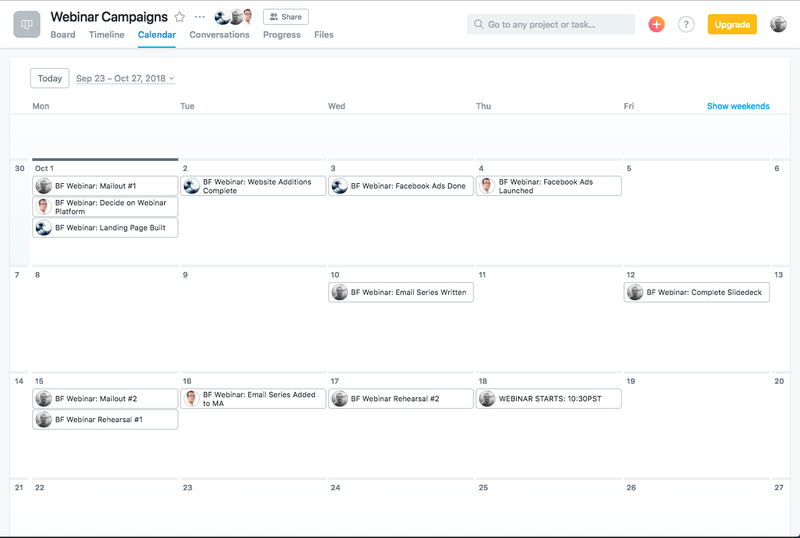 Get your team together and assign responsibilities, and use Asana (or a similar project management tool) to organize it all. Wishpond makes the creation of landing pages easy, and we're lucky enough to work for Wishpond. So building a campaign page for our webinar was relatively straightforward. The form: You should collect exactly the information you need, and nothing more. More fields will reduce conversion rate. Fewer fields, and you won't be able to personalize your follow-up emails. 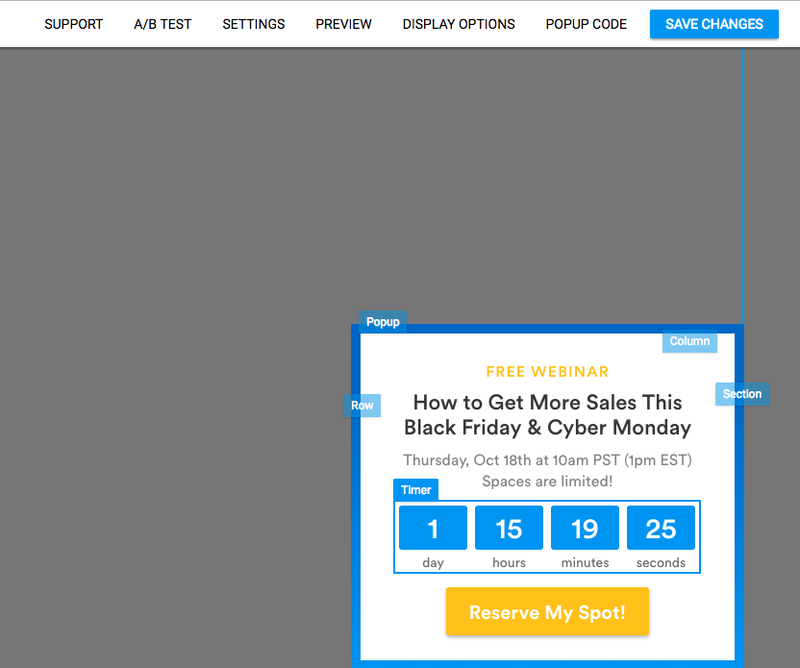 The countdown timer: Countdown timers increase urgency, and have shown to increase webinar landing page registration rates significantly. Wishpond's editor enables you to drag-and-drop a countdown timer just like this one. The "About your Host" section: You need to prove that you, or whoever is hosting your webinar, is an expert on their subject. "Why should I listen to this person for 40 minutes?" is a pretty serious question you need to answer. The "What you'll learn" section: After all, people need to know exactly what they stand to benefit from your webinar. Don't hide this. Since running this webinar, I've read more about incentivized referrals - basically, rewarding people when they share your brand or your promotion. For our next webinar, we'll be looking into ReferralCandy, which would allow us to give (for instance) a free coffee to people in our existing contact list who refer a friend to our webinar. This was Mateus' responsibility as he was going to be the one behind the scenes, running the webinar, as well as connecting it with our landing page and email tool. 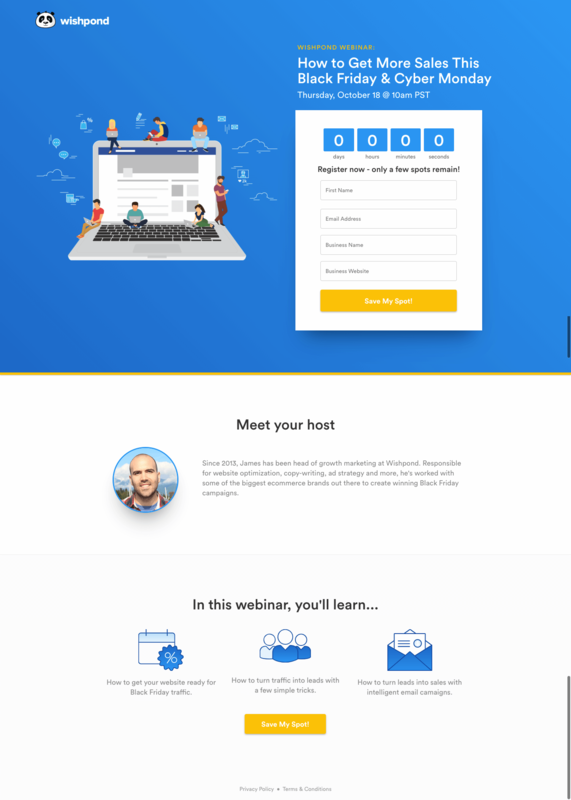 We needed a webinar platform which worked well, looked great, and connected easily with our other tools. Demio. It came up several times, and the community leader (Aaron Krall) recommended it clearly. So Mateus and I looked into it, and we absolutely love the platform. It's clean, affordable and the UX is awesome. I won't wax on about it, but yeah, it's a really solid tool. Check them out. You're not alone. 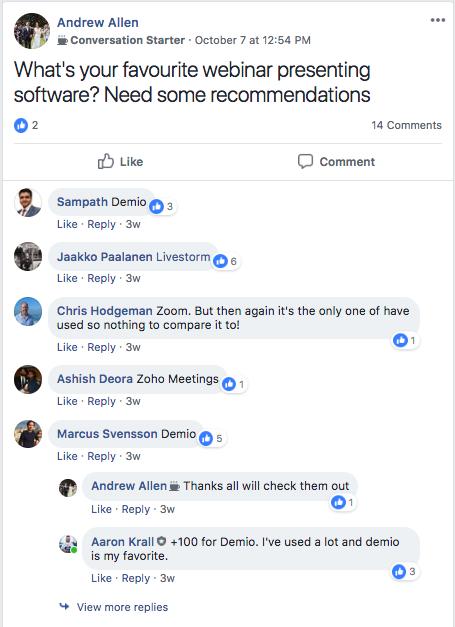 If you have a question about anything to do with setting up a webinar (or marketing in general) there are thousands of marketers willing to answer. Check out Quora, Facebook communities or, just book a one-on-one with a Wishpond marketing expert. This, like the landing page, is Carlo's wheelhouse. Website additions, like popups and welcome mats, are an awesome way to drive your website traffic to register for your webinar. He created a popup for the Wishpond blog as well as a welcome mat (which we didn't use, as we determined it could hurt our website conversion rates). Don't be afraid to kill your darlings. Creating these website additions took Carlo about half an hour. Having a tool like Wishpond makes it super simple, which means it's okay when plans change. If he'd committed a full day to creating and coding a custom welcome mat, we would have had a harder time throwing it in the trash. In conjunction with Mateus and an in-house ad expert, Carlo created the ad designs and messaging, created tests and launched nine Facebook ads. Then we sat back and watched. And the cost per registrant just kept going up. We paused the campaign, created new designs and re-launched. But we couldn't make it work. When we couldn't get below $35/registrant, we had to stop. We'd driven 11 registrants for $400. At our customer value, this wasn't profitable. If we're paying $35/registrant, and only 10% of registrants book a demo after the webinar, and our demos have a 25% subscription rate, we'd need a customer value of $1,400 to make it break even. And we don't have that quite yet. It could be our target market (marketers are notoriously expensive), but my thoughts are that you'll get more bang for your buck if you ignore ads and, instead, get webinar registrants from your website traffic or past customers (i.e. popups and newsletter mailouts). Have you made Facebook ads work for webinars in the past? I'd love to hear your strategy in the comment section! I use Google Presentation for every presentation I do. The platform is super simple, and I love the ability to share, co-edit, and add seamless transitions. Include less text than you think. Honestly, go back over your slidedeck a few times and remove text. If you need text prompts, write out notes. Don't ask your webinar attendees to read while you talk. Add transitions. This is especially relevant between paragraphs and lists. Show only one idea at a time. Make your images as large as possible. You never know what resolution or screen your attendees are going to be on. Don't bank on them being able to see what you're talking about. Err on the side of massive. Once your webinar is over, you'll need to have a strategy in place to turn registrants into customers. We've found (in other campaigns) that a 3 or 4-email series is the best way to do that. Sent automatically, a real person will get involved as soon as someone replies to the email. Other than that it's completely automatic. Thank you so much for a successful webinar! Even if you didn't attend, I wanted to send you the recording/slidedeck. Exclusive to webinar registrants, I'd like to give you a [X%] discount to [Your Business] until the end of the month. If you have any questions about anything in the webinar, let me know! Wanted to make sure you received my last email? We're offering a [X%] discount exclusively to webinar attendees until the end of the month, and I didn't want you to miss out! I won't keep bothering you, as I haven't received a response and I don't want to clutter up your inbox. I did want to send you one last thing. This [resource related to the webinar content], which can [concrete positive outcome]. I'm always here if you have questions about [webinar content]! To set these up, I recommend Wishpond's marketing automation tool. 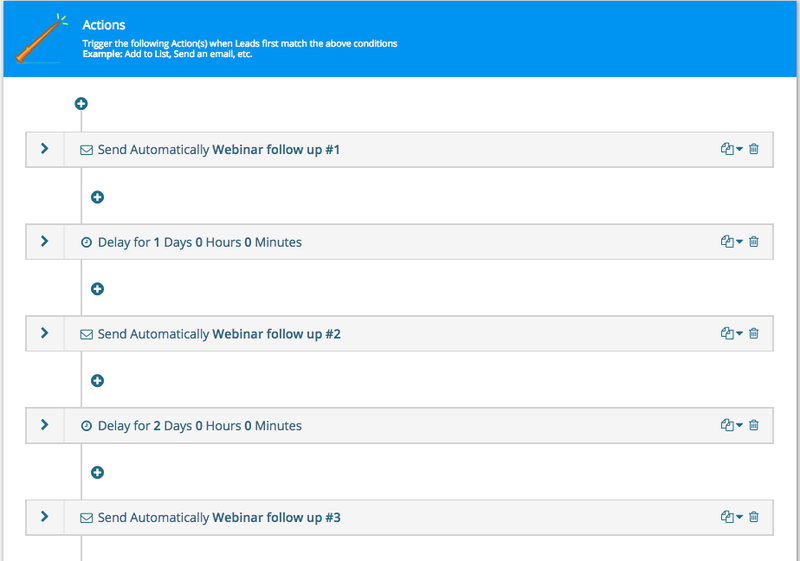 You can trigger a series of emails based on someone's registration for your webinar. Want a hand setting it all up? Creating a successful webinar funnel can be a bit intimidating. If you want a hand, Wishpond's marketing experts can help you get rolling (or do it all for you). Book a free, no-obligation call today. The biggest barrier between a profitable webinar strategy and a failed one isn't the design of the page or the content of the webinar, it's attendance. On average, only 25-50% of your webinar registrants (those people you've worked so hard to get) will show up on the day. Thanks for registering for [Webinar Name]! I'm excited for the big day, and can't wait to share the strategies we've used to [achieve concrete, positive result]. To make sure you don't miss it, use this link to add the webinar to your Google calendar: . To add "Add to Google Calendar" links to your emails, check out this url generator. Subject Line: Only 24 hours left! Only 24 hours before we get rolling with [Webinar Name]! Can't wait to see you there at [time]. To send your registrants a free coffee from Starbucks (which is more than worth it, believe me), check out the Starbucks website. We're going live with [Webinar Name] in about 55 minutes! And you still have time to earn that free Starbucks coffee by sharing this link with your friends: . Only by attending will you get my exclusive [secret strategy] which won't be in the recording! That's a bit of a gamble, that last sentence. Whether you do want to hold back something exclusively for attendees is entirely up to you. My recommendation would be to test it. Do you get more people to attend (and buy from you) if you do hold something back, or do you get more if you record the whole webinar and send it to all your registrants? We'll be going live in about 15 minutes. Grab your coffee and log in to the waiting room by clicking this link: . I will give you some strategies below for how you can still turn registrants into customers, even if they don't attend your webinar. The week of the webinar was all about setup and rehearsal. We also sent another mailout to everyone who hadn't opened the previous one (didn't want to bother people who had already registered), but I've already covered that. This section will cover the essential steps you need to take the week of the webinar and on the day itself. I scheduled two full-length rehearsal webinars for the Monday and the Wednesday before going live on Thursday morning. I invited (of course) Carlo and Mateus, but also Ali (our CEO) and a few people from sales. I wanted insight from as many different people as possible. Rehearsing is huge. Don't even attempt a professional webinar until you've done the entire thing (with recording) at least a couple times. Not only do moderators give you that extra little "this is professional" kick, they are also super helpful. Carlo and Mateus both acted as moderators during my webinar. Provide relevant links: If you mention your Twitter handle, email address or a demo link, your moderators can put it in the comment section for attendees. Collate questions for the Q&A: Rather than you having to scroll through all the comments at the end of the webinar, have your moderators put all the questions in one place. Then you can answer them more smoothly. This is a bit cheeky, but everybody does it. If there's some information you'd really like to share with attendees but you don't want to appear too salesy, have your moderators "ask" some pointed questions as if they were attendees. For instance, in my last webinar I had a total stranger/my colleague ask "How do we book a demo, again?" as well as "What software do you recommend we use to create the website popups you showed us?" But let's just keep that between us, yeah? Once I went live, I introduced myself and told everyone how excited I was to start the webinar. Then, and this is crucial, I gave attendees a couple minutes to arrive. My webinar started at 10am. I went live at 10:02 (intentionally) and told everyone I'd get rolling at 10:05. This gave latecomers time to enter the webinar. Have you ever turned channels to find a movie which started 10 minutes ago? You've missed the beginning, which is everything. You can spend the next 2 hours wondering "Wait, who's that guy? Is that the main character or the bad guy? What's he trying to do?" What's the chance you'll stick with that movie? Webinars are no different. A big part of keeping people to the end of your webinar is ensuring they're there when you start. Give them some time. So there you have it: the exact strategy we used for our most recent webinar. 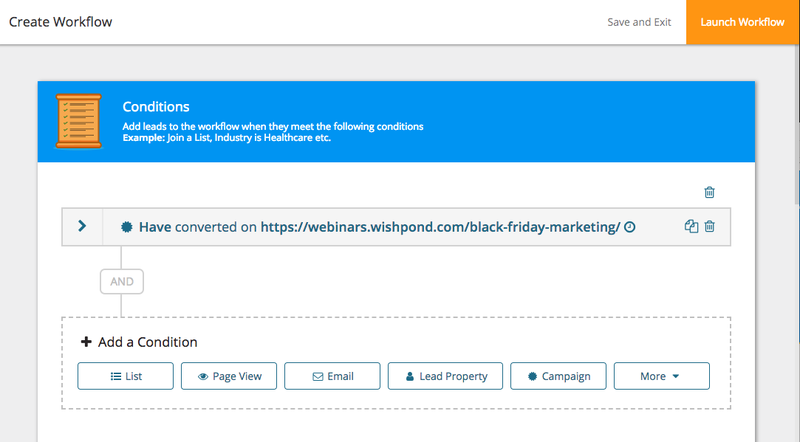 "How to Get More Sales This Black Friday and Cyber Monday" drove 524 leads, 115 of them new to Wishpond. Those leads have turned into over $11,000 in sales, and the follow-up emails are still going out. I'm super happy with how this went. It was nerve-wracking and I was sweating the whole time, but it was exhilarating and fun, nonetheless. I really hope you give webinars a shot, and let me know if you do! If you have any questions whatsoever, don't hesitate to reach out in the comment section and I'll get back to you.